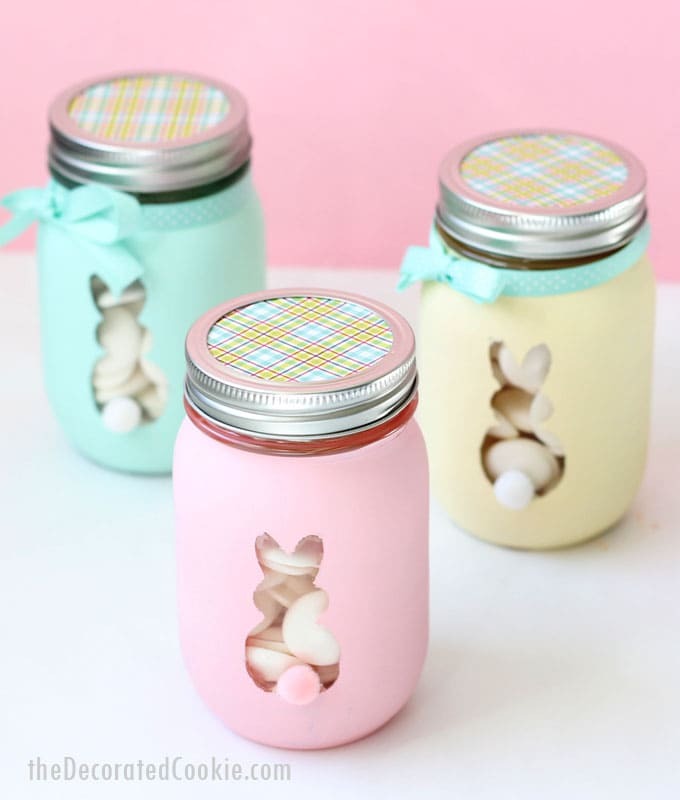 Easter bunny mason jars are a cute, DIY Easter decor idea. I know I’m usually making things like Easter bunny marshmallows and lamb cupcakes, but I’m not always about fun food. 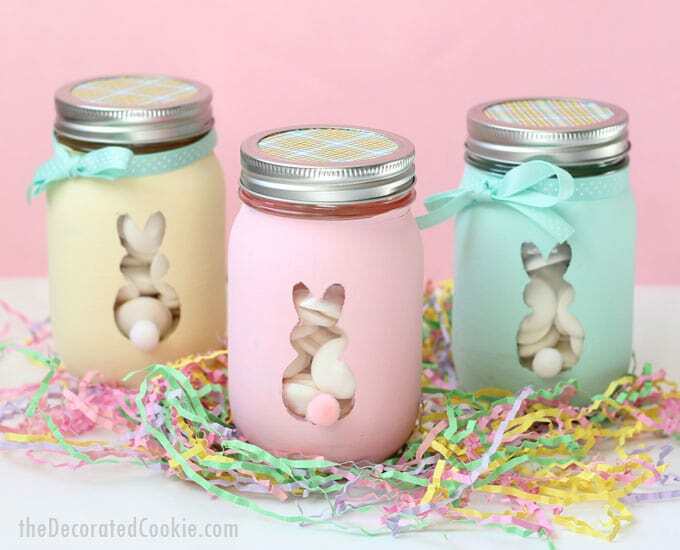 These Easter bunny mason jars are such a cute and easy holiday craft to make. Fill them with candy or votive candles and use them for Easter decor or as Easter gifts. And good news. No special equipment is needed! You can make your own silhouette bunny stickers without any fancy machines. 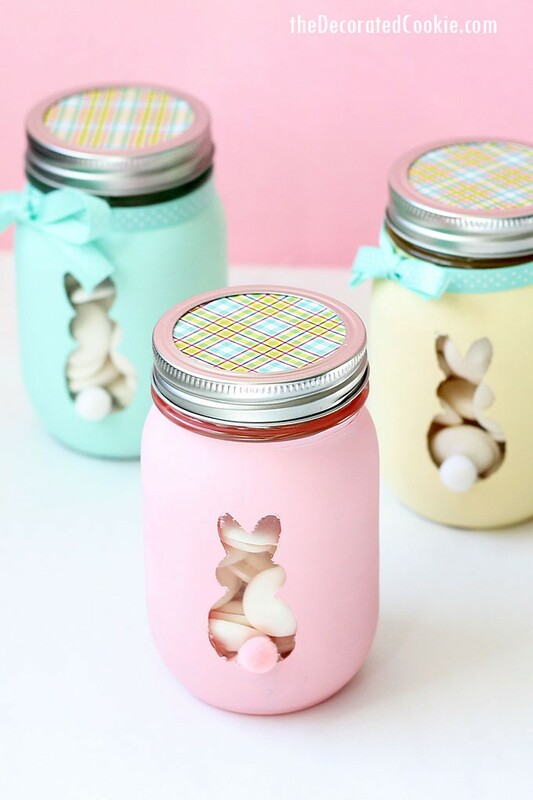 Find all the supplies you need for these bunny mason jars at the craft store. I used chalk paint here because it works so well on non-porous surfaces, often with just one coat. To make the bunny silhouette sticker, you can use your own bunny stickers or any shape you draw or find online. Below, I’ve included a template I made for you if you prefer the bunny shown here. To make the bunny sticker, place a piece of blue painters tape (4 to 5 inches long) on wax paper, sticky side down. 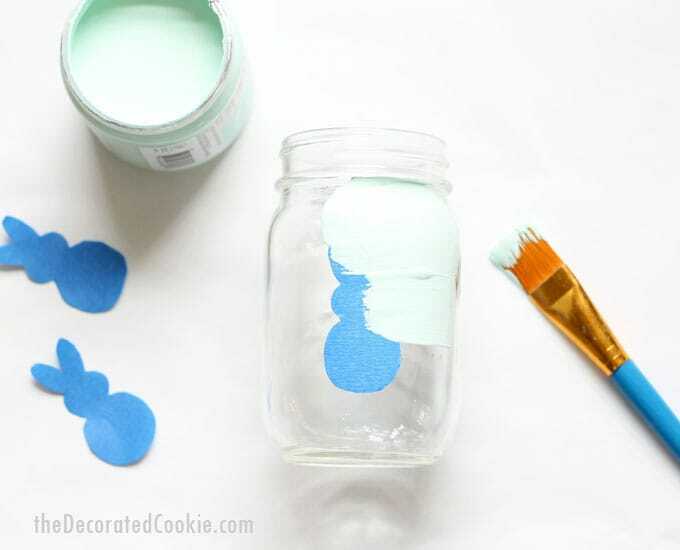 Place a second piece of blue painters tape on top of the first, sticky side down, so the sticker is thicker. Cut one of the bunnies from the template (no need to be precise, just cut a rectangle around the bunny). Place the bunny on the blue tape. 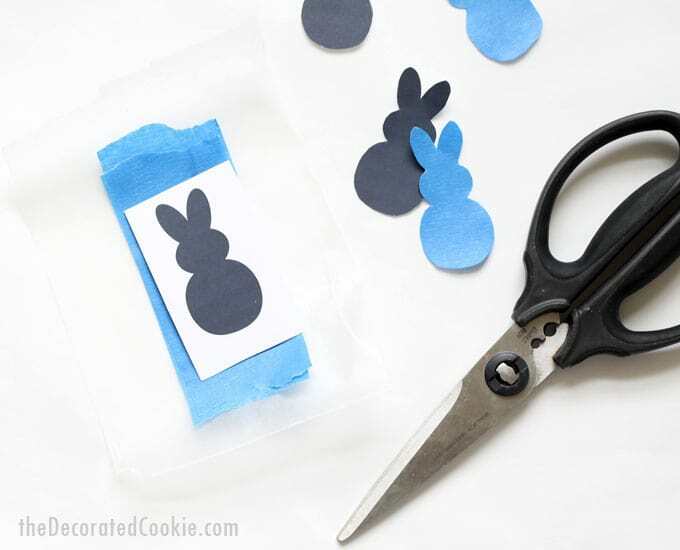 With scissors or a craft knife, cut out the bunny, cutting the template, blue tape and wax paper. Remove the wax paper from the blue tape. This may take some fiddling, but work the edge with a toothpick or your fingernail. Adhere the bunny sticker to the mason jar. If you like, add a mini pom pom tail with a dab of hot glue. Is there nothing the mason jar can’t do? 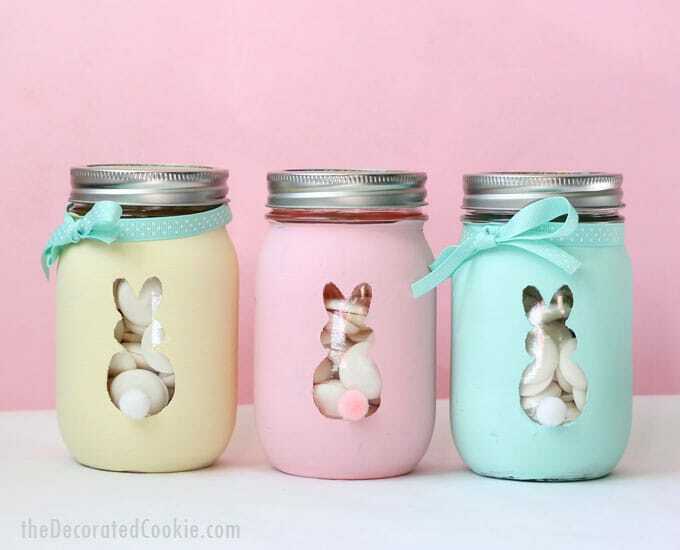 I’m loving these pretty Easter bunny mason jars. Right now, mine are filled with white candies and resting on my mantle until I can find a worthy recipient. That recipient may be me. 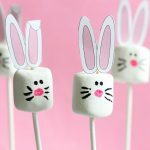 Need more Easter ideas? 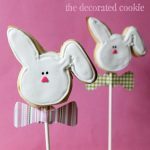 I have a Pinterest board full of Easter crafts and holiday decor. 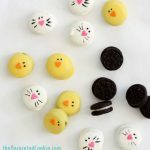 And another Pinterest board full of fun food ideas for Easter. 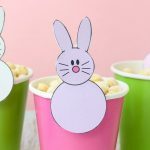 This post for Easter bunny mason jars also appears on Crafts By Amanda. I just love all your stuff. Very nice I hope mine turn out half as well as yours thanks!